I’m often asked what a typical day looks like when you’re both living and working on a Homestead. Well I can say in all honesty that it’s NEVER boring! It’s funny how it’s near impossible to plan with certainty what a day in our lives will look like. There are so many variables like weather, cattle illness, fence issues, etc. But c’mon and tag along today & I’ll show ya what a typical day looks like for us here in our Texas paradise. Of course I need to start by making a trip to the chicken coop of our 1880’s barn so I can open it up and let the hens out to free range. They love eating bugs & grass and scratching in the dirt, plus allowing the chickens to BE chickens actually makes their eggs more nutritious for us. 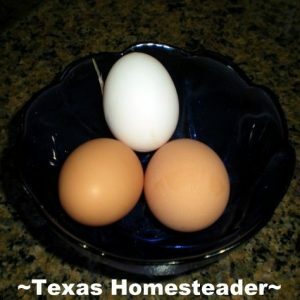 You can read my previous post about what I learned about free-range eggs here. Speaking of eggs, I wonder if the girls have left me anything this morning? Peaking into the nest box shows me that they have indeed! We only have 4 young hens but since they provide 3-4 eggs each day they supply us with more eggs than we need. So I’m thinking about selling some of the excess eggs to cover the cost of the grains we offer them to balance out their diet. It would be easy to do if we had office jobs as I know our coworkers would jump on the opportunity to buy more nutritious free-range eggs, but working here on the ranch I’ll need to figure out a marketing strategy to get the word out to sell them. I’m thinking of making up a sign or something to hang on the gate. Hummm…. Now we turn our attention to the cows This morning we will be delivering two of our younger registered Hereford heifers to a new buyer in a nearby town. RancherMan hooks up the gooseneck trailer then checks the trailer tires to make sure we’re all good. Yep, ready to go, so he backs the truck & trailer to the chute (with expert precision I might add!) Then we pen the heifers and get them onto the trailer. We head out to the new owner’s residence and drop the heifers off. We like to take a few moments with any new owner to make sure they don’t have any questions and we try to offer any helpful advice we can about their new calve’s care. I think these girls will be in good hands – there’s a young girl living here that wants to be able to hand feed the heifers. So I’m sure they will be spoiled good & proper! Now although I love these girls and I’ll miss them bunches there’s no doubt in my mind that they’re in good hands here. We were able to race the impending storms both to our delivery point & back home again while going through only minimal rain. But there’s a bigger storm coming that will involve several consecutive days of rain so we’ll need to get the animals taken care of before it arrives. Driving the tractor on wet ground contributes to ground compaction which negatively affects your soil’s ability to grow quality forage, plus it leaves deep ruts that never, EVER go away. (go ahead, ask me how I know… eh hem). Although there’s plenty of green grass this time of year it’s beginning to turn hotter and the cool-season rye grass is already headed out and dying back so we want to make sure there’s plenty for the cattle to eat. Of course it’s when you’re trying to race the weather that you find random obstacles such as having a flat tractor tire. 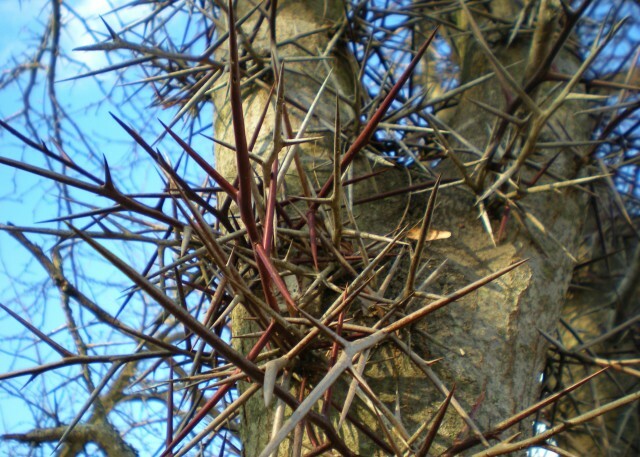 (sigh…) We have many heavily-thorned menaces on our property called Honey Locust trees. They’re beautiful trees but their thorns are deadly – easily flattening a tractor tire. So this hazard is something we deal with quite frequently. Yes indeed, we’re both working steadily to rid our property of each and every one of these trees. (microphone please…) One day it WILL be done! So RancherMan walked back to the garage & came back with the portable air tank. In no time the tractor tire is aired up again. A little Berryman’s to seal any punctures and we’re finally good to go. In our operation we have different cattle in different paddocks based on where they are in their reproduction. Bred cows & the heifers too young to be with the bull are kept in one paddock, the bull and heifers that are old enough to be bred are in another paddock, weaning calves in still another paddock and so on. So it takes two of us to move hay since the tractor always gets the cows’ attention and sends them running to greet us at the gate. RancherMan drives the tractor & I man the gates to keep them all in their proper paddocks. Finally the cattle are all fed so now we turn our attention to the goats. We gather large buckets of hay and fill their hay feeders and check their water. The feeder holds quite a bit of hay so once they’re loaded up we’re comfortable they’ll have plenty to eat for several days if the rain hangs on that long. Before we’re through we top off their feed bowl with some pelleted feed as well, which they devour with relish. Well now the clouds are darkening and it looks like we’ll be in for a few rainy days. I really need to be in the garden and the rain we received a few days ago has certainly made the grass & weeds start popping in my garden. But with a sigh I resign myself to the fact that the rest of the day will have to be used for inside work. Thank goodness the grass-clipping mulch I use in the raised beds will at least slow down the weed march! So inside I go. I have quite a few eggs in the fridge so I decided to make egg salad for RancherMan’s lunches. Peeling very fresh eggs can be done but it’s easier to peel eggs that are at least a week old – I pull out about a dozen and get to work. 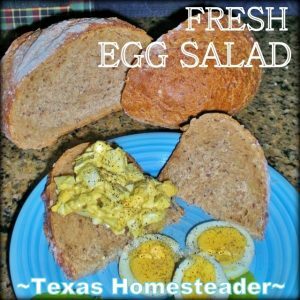 In no time his egg salad sandwich spread is made and we enjoy a quick lunch. I decide to throw a couple of loads of laundry in the washer. Even though we have a drier I don’t like to use it (just an environmental thing for me) Although I love the scent of line-dried laundry it’s not an option today so I’ll pull out my drying racks and set them up in the spare bedroom for the laundry to dry throughout the day. Now that I’m stuck inside I’ll do some cleaning, some blog writing, some financial work, etc. RancherMan does some research from his computer and deals with a few calls from potential buyers. As the day turns to evening I start thinking about preparing something for supper. I use the Cook-Once-Eat-Twice method of cooking so our meals are home cooked and delicious but very streamlined. Yesterday I pulled some stuffed peppers from the freezer and placed them in the fridge to thaw. 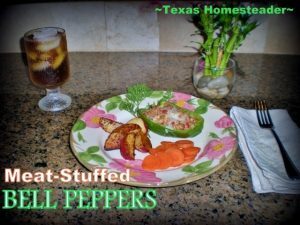 So dinner preparation is as easy as heating up the stuffed peppers, steaming some sliced carrots with rosemary from the back porch, frying up red potatoes, and adding some fresh bread to round out the meal. For dessert we’ll keep it simple by opening a chilled can of vanilla pears I canned last fall and serving them up in bowls with sweet blueberries sprinkled on top. Delicious, healthy and simple. C’mon y’all, you know I’m all about simple cooking! Now it’s getting later so I’ll tripsy out and lock the chickens safely back in their coop for the night, tidy the kitchen and take a quick shower to clean off the day’s work. Now comes my favorite time of the day when I snuggle on the couch with RancherMan to watch a little TV before bed. (yaaaawwn) After a short time relaxing together our day is finally done. Hope you enjoyed our day at the ranch, hope to see ya again soon! * A word about our Affiliate Link – We are currently enrolled as an Amazon Affiliate. Occasionally I will insert an affiliate link into one of my posts if I think it may be of interest to you. I receive nothing from the manufacturer, but we love Berryman’s & thought you might too. If you click on any of my affiliate links and buy something (almost anything, not just what was linked) I get a small referral percentage from Amazon. But here’s the really important part – the price you pay for your items is UNCHANGED. When you buy something through the affiliate link it’s a great way to support this blog without anything coming out of your pocket so please click often! 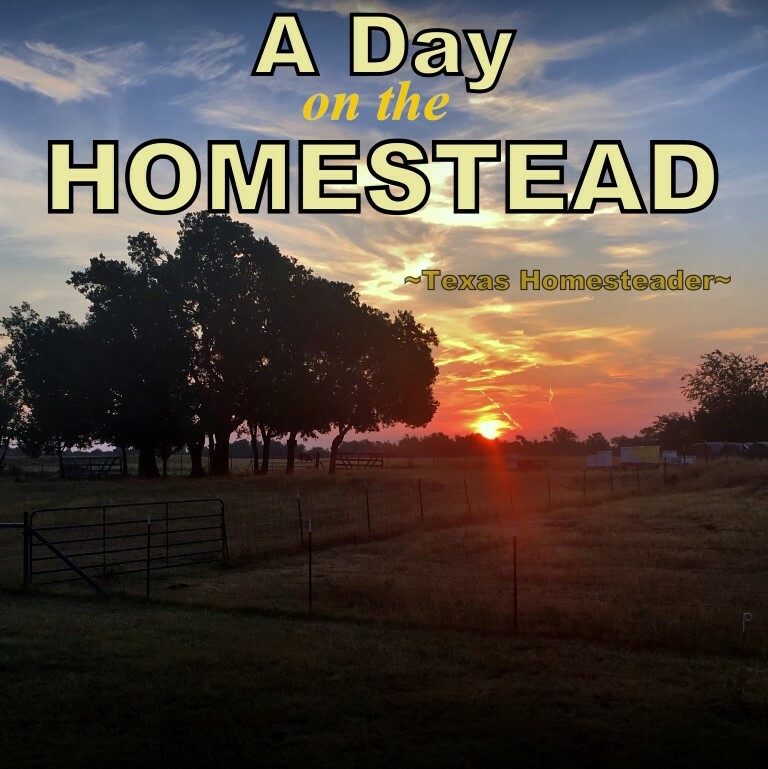 This entry was posted in Blog Posts and tagged Barn, Calves, Cooking, Ranch Life, Registered Hereford, Small Town Living, weather on May 18, 2014 by Texas Homesteader. Thank you for the tour! It was fun to tag along for a day on the ranch! Sounds like a full and satisfying day. Have you considered posting an ad on Craig’s List for your eggs? It’s free and you may find folks who are looking for free-range, local eggs. Your days sound pretty much like ours…isn’t nice that at the end of the day you know you put in an honest days work, on your own land and in your own time! Sounds like a day in paradise! Your property is very beautiful. Two quick comments… Have you done a post on your goats? I’d be interested in hearing more about what part they play on your ranch. And the other thing I wanted to mention is please don’t become too discouraged in finding buyers for your eggs. We’ve been doing it for several months and word is getting out. It’s so nice to see the accounting for what we pay in feed start to equal egg sales. Have a great day! Growing up on a farm I know exactly what you are talking about. it’s a never ending job working from sunrise to sunset and sometimes to way after dark. We had all sorts of animals; milking cows, sheep, pigs, ducks, chickens, and my brother even raised rabbits and then of course we always had a horse to ride around on. I remember unloading bails of hair and putting them on the conveyor belt and up to the barn loft they would go and they had to be stacked just right or they would fall over. I must say, I do miss not living on a farm. Right now we live in a double wide mobile home on an acre of land of which we call it ‘Poor Man’s Ponderosa.’ :} The Honey Locust trees are just plain wicked. Just as bad as those Mesquite trees are. They can puncture a rider mower tire real quick like. Thank goodness we don’t have any on our property. I don’t know what changed. but I received your email update newsletter this morning. Came through@ 7:20. :} Have a wonderful day and don’t work 2 hard. I need to go out and water my onions and peppers as well as my rose and daylily bed. Enjoyed reading about your life on the ranch. Best of luck on your egg selling business. I just wish I lived closer. When I buy eggs at the grocery, I usually end up buy 3 – 18 count cartons or sometimes the box of 5 1/2 doz. Yes, I use A lot of eggs but then I enjoy baking. Sugar; that I normally buy a 25 lb. bag at Sam’s Club. Those little 5 or 10 lb bags wouldn’t last long for me. LOL Colleen. I love that your subscription emails are coming in again! Woo-hoo!